Sea Shepherd Conservation Society christened its latest research vessel Saturday morning in Marina Del Rey, Calif. naming it after award-winning actor and ocean activist Martin Sheen. Ocean activist Martin Sheen speaking at the press conference aboard the RV Martin Sheen, Captain Oona Layolle in the background. Photo credit: Naio Halter. Martin Sheen has campaigned for 25 years with Sea Shepherd and long-time friend and founder of the movement Captain Paul Watson. These two intrepid warriors have stood shoulder-to-shoulder opposing brutal bludgeoning of Harp seals along Canada's eastern seaboard. Sheen told me that, "It's a huge honor and privilege to have a research ship named after me. The biggest risk and danger to the world today are plastics in our oceans. The RV Martin Sheen will conduct scientific research on ocean plastics to protect our oceans and all its sealife." Sheen agreed that it's imperative that all nations globally work hand in hand to prevent over 20 million tons of land-based plastics each year from entering our oceans and being eaten by fish, and suffocating a hundred thousand marine mammals and a million sea birds. Sheen joins Brigitte Bardot, Bob Barker, Steve Irwin and Sam Simon in an elite class of Hollywood stars, conservationists and television executives who support Sea Shepherd and have vessels named in their honor. It was a salubrious and jovial Saturday morning along the docks at Marina Del Rey joined by Captain Paul Watson via Skype from Paris, France. The addition of the RV Martin Sheen to Sea Shepherd's fleet strengthens their research commitment and ability to protect the ailing oceans at a crucial time in the history of the human race. 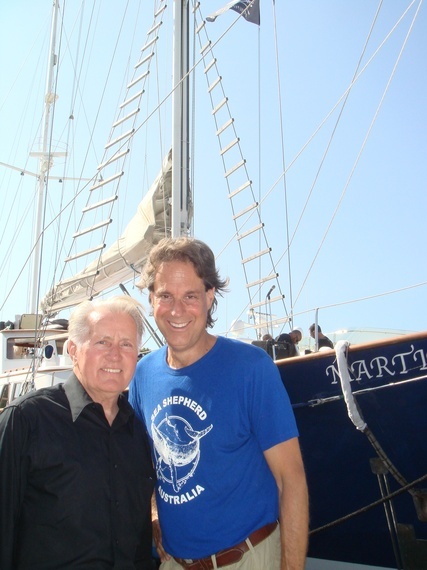 Martin Sheen and Earth Dr Reese Halter at the christening of the RV Martin Sheen, Sea Shepherd's new research vessel. Photo credit: Naio Halter. Earth Dr Reese Halter's soon to be released book is entitled "Shepherding the Sea: The Race to Save Our Oceans."